I just realized that today is National Junk Food Day. Who would’ve thought that there is a national day celebrating junk foods? 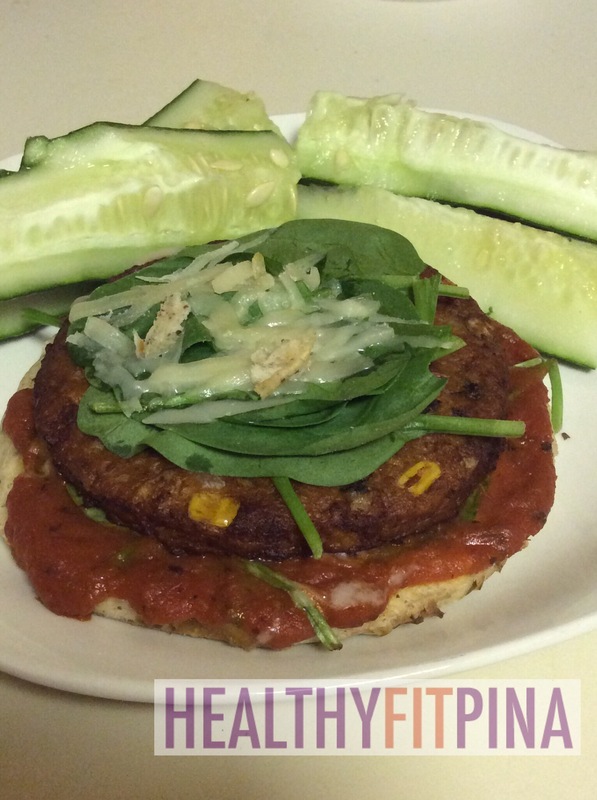 Well, in celebration of this day, I decided to have healthy “junk” food for dinner — an open-face veggie burger w/ cheese! Here’s a quick recipe, all cooked in the microwave. I would’ve used a conventional oven, but I was hungry! Using the tray from the TLS package, place on top the crust, tomato sauce and some of the spinach leaves. Microwave for 1 minute. Place the veggie burger on top of the heated crust, then add the rest of the spinach and the cheese that came with the package. Microwave for another 1 minute or until the cheese is melted. If some of the contents are still cold, microwave every 30 seconds until hot. Add cucumber sticks and hummus on the side.